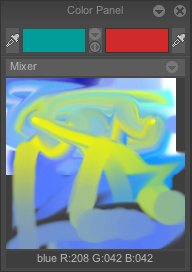 - A left click on the mixer surface incorporates the A color to the visible mixer which can then be «spread». You then can mix your colors like a painter. By right-clicking, you will open a contextual menu, specific to the Mixer option. The second action, Pick a color, lets you choose a color on the location of your cursor (or stylus). 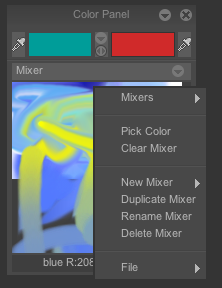 If the mixers proposed are not what you want, you can also use Clear mixer in the sub-menu. You then will have a clean palette. It’s up to you to create new mixes. This right-click shows you a menu with lots of options. 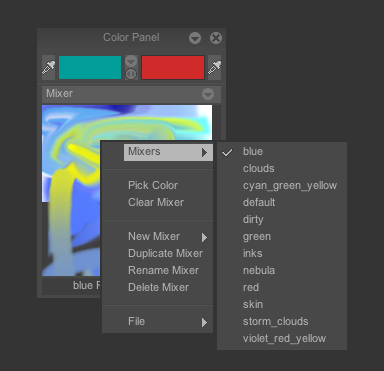 Firstly, you can choose to work with predefined : blue, clouds, inks, dirty, nebula, etc..
A small sign lets you know the name of the chosen mix. - Empty : after opening the dialog box where you can name your future creation, you have a clean palette, ready for your new mixes. 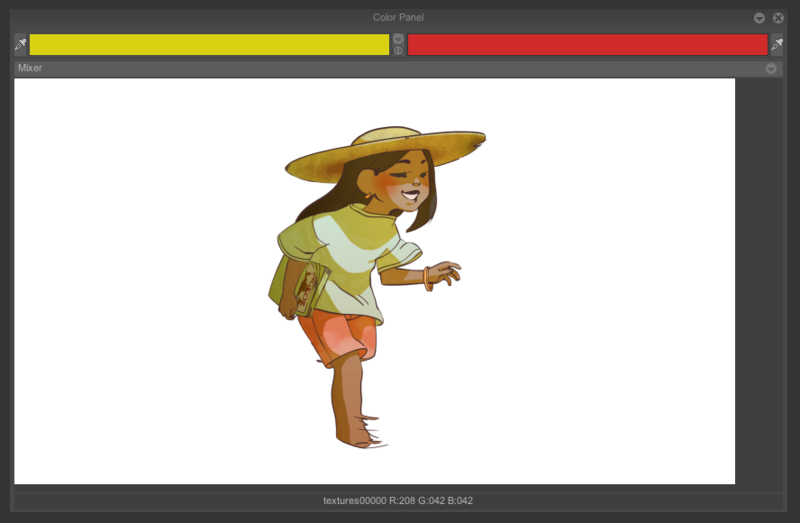 - From current image : your current drawing will be "imported" in the panel. You can zoom in the workspace to work more efficiently with your new mix. - From image… : lets you create a new mix from an image that need to be imported in the Library*. Your mixes will be accessible in the Mixer list on top of the menu. - Delete mixer : lets you delete a mixer from the list. A confirmation window appears to ask a confirmation. *For everything related to the Library, please read the chapter dedicated to it. 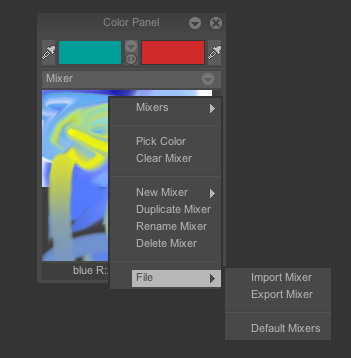 - Import Mixer : lets you open an image inside the panel to pick the colors or create new mixers. You can also increase the panel’s size, like the Pick panel. - Default Mixers : lets you return to TVPaint Animation’s default mixers, in case you lost them or if your mixers have gone too far.